Yesterday, the Discovery Channel aired the highly anticipated show “Into the Blue Hole”. The two-hour event followed famous hosts, Sir Richard Branson and Fabien Cousteau. Along with a crew of scientists and specialists, they ventured into the depths of the largest marine sinkhole in the world. 410 feet deep, the explorers observed within the confines of a state of the art submarine. They witnessed a cathedral in the gloom. It is another world below. Massive columns of sediment towered over them, ironically shedding light on the history of the planet itself. The Great Blue Hole and other sunken caverns like it are submerged time capsules. The information they have to offer takes you back thousands of years. The expedition was a long thought about concept. When the CC+L team met with Aquatica’s CEO Harvey Flemming, he admitted that this was something they had been talking about for years. It is surreal that it actually happened. In fact, The Blue Hole exploration took an entire year to prepare. An exploration of this importance is a gift in a scientific world. The data about our marine environment will serve as inspiration for the battle against climate change. To feel like we were a part of history the CC+L team along with Maya decided to take a look at the monumental event that was taking place at our beloved landmark. 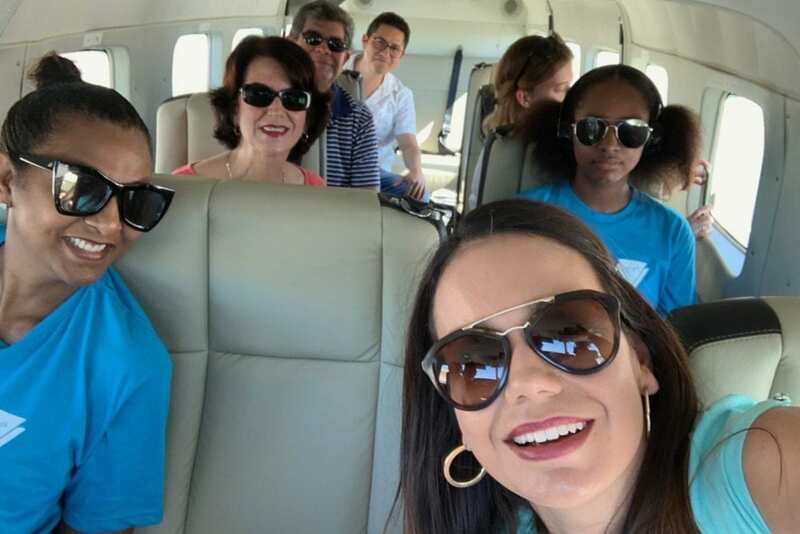 On Sunday afternoon, a group of fans that included CC+L creative director and the Prime Minister’s wife and daughter took flight to watch the unfolding of what was going on below. 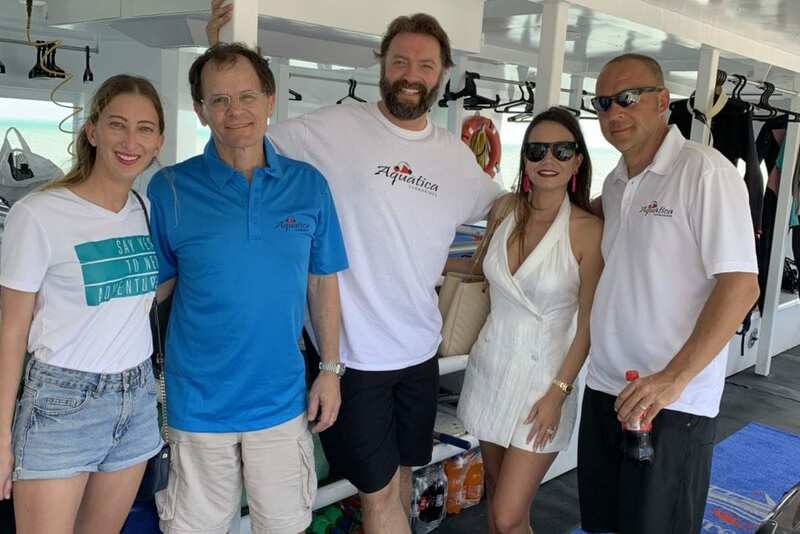 The CC+L team, family and friends on Maya’s Blue Hole tour. 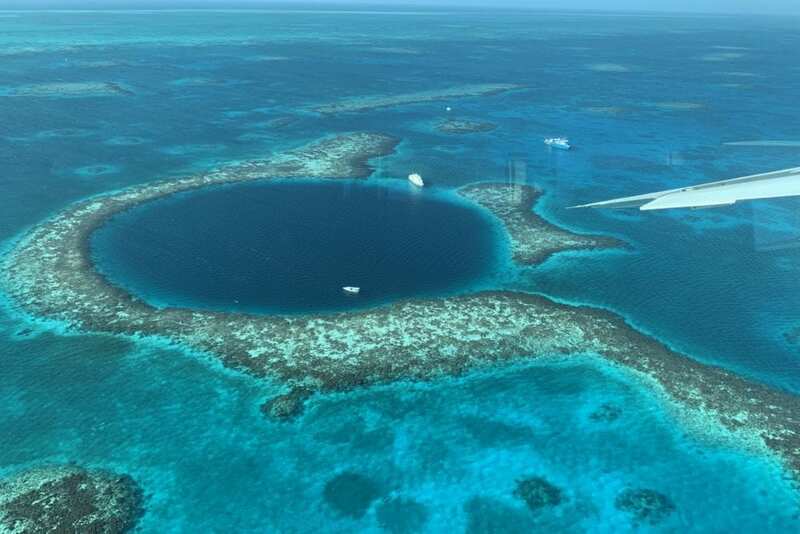 Maya’s Blue Hole tour takes you on a stunning ride over the Belize Barrier Reef. From your seat you take in the mesmerizing hues of green and blue. The appreciation for the beauty of Belize is undeniable. The scenic tour includes a view of Shark Ray Alley, Turneffe Atoll, the ocean freighter wreck, Lighthouse Reef and 2 revolutions per port and starboard around the Blue Hole. Flying as low as 500 feet, we saw the vessels that housed the crew. In contrast with dark blues of below, the day couldn’t have been brighter.